Richard Nixon is credited for having a strong record on foreign policy, but his record on domestic policy — especially on Civil Rights at home is often overlooked. During his years as vice president under Dwight Eisenhower, he sought to ensure minorities — especially African Americans — weren’t discriminated against in federal contracts. He also worked with Congress to spearhead the Civil Rights Act of 1957, sweeping legislation and a precursor to the landmark Civil Rights Act of 1964 and Voting Rights Act of 1965. In 1970, perhaps the hall mark of the Nixon administration’s Civil Rights policies, Nixon sought to end the decades old and egregious tradition of segregated schools for black and white children throughout the nation, predominantly in the Southern states. The Eisenhower administration accomplished much in the area of Civil Rights. It was President Eisenhower who integrated the armed forces, promoted more blacks into the federal bureaucracy than his predecessors, and appointed federal judges, and lawyers in his justice department, who supported racial justice. In 1954, the World War II general also sent U.S. National Guard troops to integrate Little Rock’s Central High School to enforce the 1954 unanimous Supreme Court ruling in Brown v. Board of Education, which held that “separate educational facilities are inherently unequal,” and overturned a half century of Court precedent which stated otherwise. Shortly before taking office in 1953, Eisenhower signed an executive order creating an interdepartmental body, the President’s Committee on Government Contracts, succeeding the Truman administration’s Contract Compliance Committee, to combat discrimination among contractors retained by the Federal Government. Eisenhower selected Nixon to chair the committee, a move that highlighted its importance. 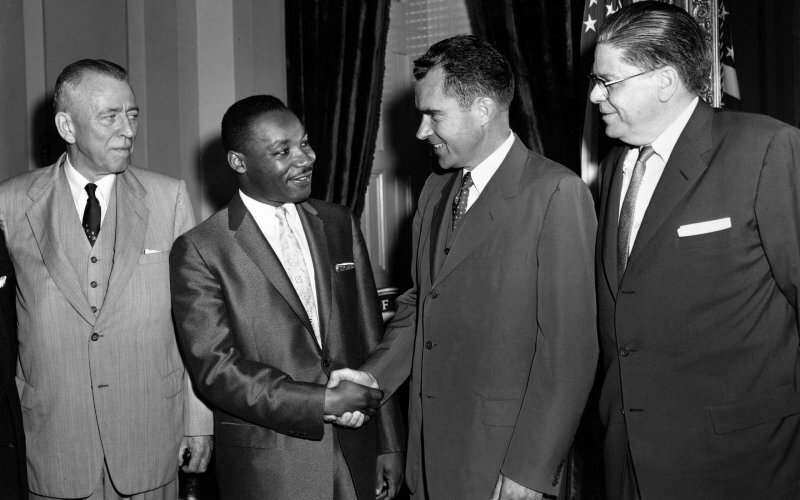 The board made up in influence what it lacked in enforcement power, and Nixon used his chair to meet and forge relationships with Civil Rights leaders including Martin Luther King, Jr., Ralph Abernathy, and NAACP director Roy Wilkins; lobby companies to end discrimination; encourage African American ownership of businesses and employment to executive positions. During his second term as vice president, Nixon shepherded through Congress the Civil Rights Act of 1957, the first Civil Rights legislation since reconstruction. The 1957 legislation empowered the Justice Department to prosecute Civil Rights cases through a newly established Civil Rights Division, and allowed federal prosecutors to obtain court injunctions when the citizens’ right to vote was being obstructed. Nixon’s role proved to be crucial in Congress. He was vocal about the administration’s Civil Rights goals, and serving in his Constitutional role as President of the U.S. Senate, he helped lead the effort to bring the bill to the Senate floor. The next decade saw great progress on the Civil Rights front. President Johnson signed the Civil Rights Act of 1964 — landmark legislation that made employment discrimination illegal, banned discrimination in all public places, and provided for the integration of public schools. In 1965, Johnson signed the Voting Rights Act, outlawing discriminatory voting procedures, including literacy tests that were commonplace in the post-Civil War South. The 1960s were also a time of great social upheaval. Racial tensions mounted in the South and riots erupted in major cities like Washington, Baltimore, Los Angeles, New York, and Chicago. In April 1968, the great Civil Rights leader Martin Luther King, Jr. was assassinated outside his hotel room in Memphis, Tennessee. Some historians say that by the time Nixon was inaugurated in 1969, the nation was its most divided since the Civil War. One of the pressing issues of Nixon’s first administration was school desegregation. Despite the unanimous ruling in Brown v. Board of Education Topeka (1954) and the passage of the 1964 Civil Rights Bill, 80 percent of schools remained segregated throughout the nation’s South. The Nixon administration chose to adopt the policy position of a unitary school system, however to avoid the controversial issue over bussing, favored it on the basis where children, without taking in account race, would attend schools closest to their homes. In early 1970, Nixon formed a cabinet committee to solve the impasse. Vice President Spiro Agnew, who received bi-partisan praise for his leadership in ending the Baltimore riots of 1968, was named chairman. Nixon named Secretary of Labor George Schultz, an Eisenhower administration veteran and former Dean of the University of Chicago Business School, as vice chairman. Since Agnew was preoccupied by political considerations, Schultz took the reins of the committee’s operations, and actively implemented a comprehensive plan for integration of schools. 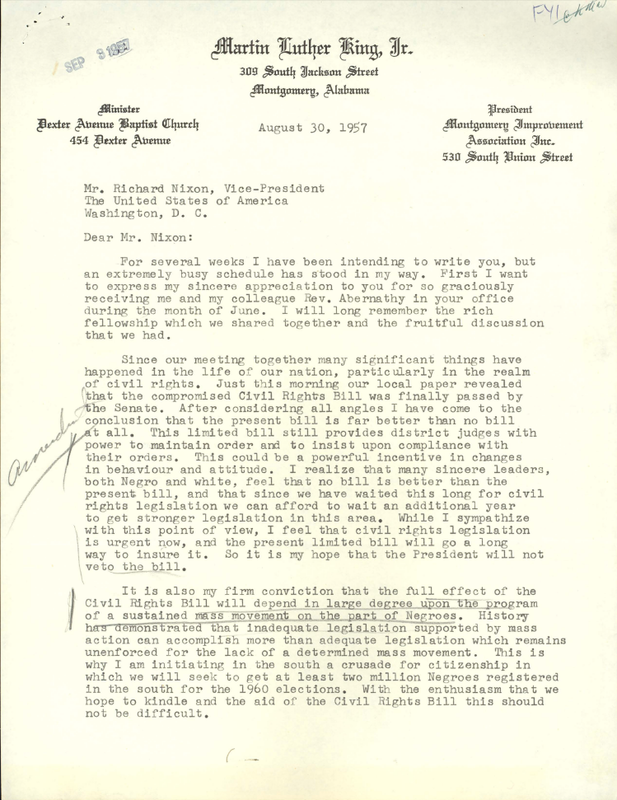 The administration’s position was to enforce the Brown decision that integration “should take place with all deliberate speed,” but rather than the federal government forcing how the matter would be resolved, it would be left up to bi-racial committees representing each of the seven Southern states. We met in the Roosevelt Room in the White House, right opposite to President’s Oval Office. The discussion was civil, but deep division was evident. Deep division. A lot of them argue and get them out of their systems, about two hours. Then a point came in the meeting after about two hours, and this repeated itself with all of the subsequent states when I thought it was time to shift gears. So I had a little prearrangement with John Mitchell, who was standing by and he came in to our room. He was known throughout the south as a tough guy, and then who was regarded, as the white says, their man. Schultz continued to explain that he learned that when parties get close to an agreement, they become fully invested, and will do everything to make it work. He gave an example of two of the Mississippi delegation who he wanted to co-chair the state’s committee. Despite early divisions in the committee’s conversation, Warren Hood, the white president of the Mississippi Manufacturer’s Association was able to talk constructively with Dr. Gilbert Mason, a black physician and head of the Biloxi Chapter of the NAACP. At the right moment, Shultz would bring the delegations to the Oval Office to speak with President Nixon, who would explain to them the magnitude of the decisions that were made throughout the history of the White House, and the historic nature of the decisions they would be making for their country, state, and local communities. The plan proved pivotal to the end of school segregation. In fall 1969, 600,000 blacks attended desegregated schools in the South; one year later 3 million had been integrated. By percentage in 1968, nearly 70 percent of black children were segregated from their white peers; by the end of Nixon’s first term it was just 8 percent. President Nixon signed the Voting Rights Act of 1970, nationalizing the 1965 legislation and expanding its reach to northern states. The Nixon administration ended discrimination in companies and labor unions that received federal contracts, and set guidelines and goals for affirmative action hiring for African Americans. The policy, known as the Philadelphia Plan (from where it originated) — initially included government contracts in excess of $500,000 in the construction trade, and later expanded to include contracts of $50,000 or more in all areas of industry, and quotas for women. President Nixon signed the Equal Employment Opportunity Act of 1972 giving the Equal Employment Opportunity Commission (EEOC) greater power to enforce against workplace discrimination. Between 1969 and 1972, the EEOC staff had increased from 359 to 1,640 and budget from 13.2 million to $29 million. Another policy pillar of the Nixon administration was expanding education and economic opportunities for African Americans. To lead this initiative, the President appointed Robert J. Brown, an African American business leader, as a White House special assistant. Following a meeting with the presidents of black colleges, arranged by Brown, Nixon promised more than $100 million in federal funds for black colleges. Government assistance to black owned business enterprises also more than doubled. Federal purchases increased from $13 million to $142 million from 1969 to 1971, and total revenues from black businesses jumped from $4.5 billion in 1968 to $7.26 billion in 1972. By 1974, two-thirds of the 100 largest black enterprises had been started during the Nixon administration. For Brown, Nixon’s civil rights legacy remains strong — one that has positively affected the lives of tens of millions of African Americans. Brown, Robert. J. “Long Before First Black President, Nixon Forged Strong Civil Rights Legacy. 20 February 2016. nixonfoundation.org. Web. 31 July 2017. Civil Rights Act (1964). ourdocuments.gov. Web. 31 July 2017. Garvey, Marshall. “Growth and the Minority Business Enterprise.” 26 August 2013. nixonfoundation.org. Web. 26 August 2013. Gellman, Irwin F. The President and the Apprentice: Eisenhower and Nixon, 1953-1961. New Haven: Yale University Press, 2015. Pages 137, 141, 142, 388, 393. Hoff, Joan. Nixon Reconsidered. New York: Basic Books, 1994. Pages 93-94. Johnson, Theodore and Rigeur, Leah Wright. “The GOP’s Long History With Black Colleges.” 27 February 2017. Politico Magazine. Web. 1 August 2017. Kotlowski, Dean. Nixon Civil Rights: Politics, Principle, and Policy. Cambridge: Harvard University Press, 2001. Pages 31, 33. Letter from Vice President Nixon to Mr. Don Murphy. 20 August 1957. Richard Nixon Presidential Library. Letter from Rev. Martin Luther King, Jr. to Vice President Richard Nixon. 30 August 1957. Richard Nixon Presidential Library. Nichols, David. “Ike Liked Civil Rights.” 12 September 2007. New York Times. Web. 31 July 2017. Nixon, Richard. First Presidential Inaugural Address. 20 January 1969. presidency.ucsb.edu. Web. 31 July 2017. Rosen, James. The Strong Man: John Mitchell and the Secrets of Watergate. Doubleday. 2008. Pages 143-144. Shultz, George. “Nixon and School Desegregation: A Perspective from George Shultz.” Transcript of Speech Given at Richard Nixon Presidential Library. 9 January 2003. nixonfoundation.org. Web. 31 July 2017. Voting Rights Act (1965). ourdocuments.gov. Web. 31 July 2017.